There are various definitions of clean steel. The term clean steel is also vague. Clean steels are generally those steels that have low levels of the solute elements sulfur, phosphorus, nitrogen, oxygen and hydrogen; controlled levels of the residual elements copper, lead, zinc, nickel, chromium, bismuth, tin, antimony and magnesium; and, a low level of non metallic or oxide inclusions. The requirements vary with the steel grade and its end use. Clean steels used for one application may be often not acceptable for a different use. Steels with low levels of solutes are sometimes termed as ‘high purity steels’ while steels with low percentage of tramp elements are often called ‘low residual steels’. Sometimes steels with a low frequency of product defects that can be related to the presence of oxide inclusions are called clean steels. Hence the definition of ‘clean’ is not absolute. Instead it is based upon the product formed from the casting and the in-service use or life of the product. In addition, the definition ‘clean’ is comparative since the cleanliness standard desired by the customer is continuously changing as a function of time and technological improvements. The term ‘clean steel’ is therefore continually variable depending upon the application. The individual or combined effect of solute elements such as carbon (C), phosphorus (P), sulphur (S), nitrogen (N), hydrogen (H) and total oxygen (T.O.) is known to have a remarkable influence on the steel’s properties, such as tensile strength, formability, toughness, weldability, cracking resistance, corrosion resistance, and fatigue resistance etc. The extent of control of the solute elements needed in the steels depends on the performance expected from the steel. The influence of the solute elements on the properties of steels is given in Tab 1. This table shows that some elements are harmful for certain steels but may be less harmful or even useful to some other steel grades. Inclusions are non metallic particles that are trapped in the matrix of steel. Non metallic inclusions are undesirable components of steels. They play an important role with respect to their effect on the steel properties. Exogenous inclusions are those that come from sources outside of the steel while the Indigenous inclusions are those that are formed by the chemical reactions inside the liquid steel during its processing. Among various types of nonmetallic inclusions, oxide and sulphide inclusions have been thought to be harmful for common steels. Non metallic inclusions in steel usually have a negative contribution to the mechanical properties of steel, since they can initiate ductile and brittle facture. A control of non metallic oxide inclusions and controlling their size distribution, morphology and composition is needed during the production of clean steels since the cleanliness of steel depends on these factors. Control of inclusions in steel is closely connected with the concept of ‘clean steel’. The aim during steel production is to eliminate undesirable inclusions and control the nature and distribution of the remainder to optimize the properties of the final steel product. All steels contain non metallic inclusions to a greater or lesser extent. The type and appearance of these non metallic inclusions depends on factors such as grade of steel, melting process, secondary metallurgy treatments and casting of steel. The presence of non-metallic oxide inclusions is a major cause of incompatibility between the attainable and desirable level of cleanliness in many grades of steel. These non metallic inclusions degrade the mechanical properties of the steel and are the cause of dangerous and serious material defects such as brittleness and a wide variety of crack formations. They increase the risk for mechanical and/or corrosion failure of the final product. However, some of these inclusions can also have a beneficial effect on steels properties by nucleating acicular ferrite during the austenite to ferrite phase transformation especially in low carbon steels. Various types of inclusions in steels are shown in Fig. 1. The inclusions generate many defects while many applications restrict the maximum size of inclusions. Hence the size distribution of inclusions is important in the steel. The requirement of cleanliness of for various steels is given in Tab. 2. The increasing demand in recent years for high quality steels has led to the continuous improvement of steelmaking practices. There is a special interest in the control of non metallic inclusions due to their harmful effect on the subsequent stages and their great influence on the properties of the final steel product. The quality of the final product is controlled through the control of the amount, size and chemical composition of the inclusions. 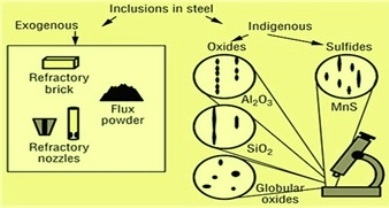 The control of the formation of non-metallic inclusions and the identification of their constituent phases are of extreme importance for the obtaining of clean steels. The cleanliness in steel is achieved through a wide range operating practices which include the additions of deoxidizing agents and ferro alloys, the extent and sequence of secondary metallurgy treatments, stirring and transfer operations, shrouding systems, tundish geometry and practices, the absorption capacity of the various metallurgical fluxes, and casting practices etc.